I did use twigs. They were generated with MTree addon. Currently working on showing my method. The trees are optimized for topology, but they are still full trees (geometry twigs instead of billboard branches). I have a scene with 42,000 trees (according to particle system Number fields) comprised of 3 different tree models, each with its own particle system. 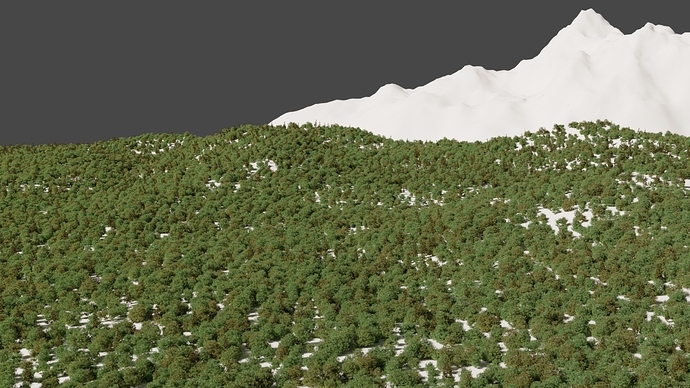 It takes up about 6GB of RAM, including an untextured landscape with ~52,000 tris. This one has 3 different tree models. The 2 deciduous tree models are geometry down to hex leaves (8 verts, 6 tris per leaf), and the evergreen trees are ‘game hero’ level of detail (geometry down to twig fans). The total memory cost of the scene peaks at 7659M (7.7G). 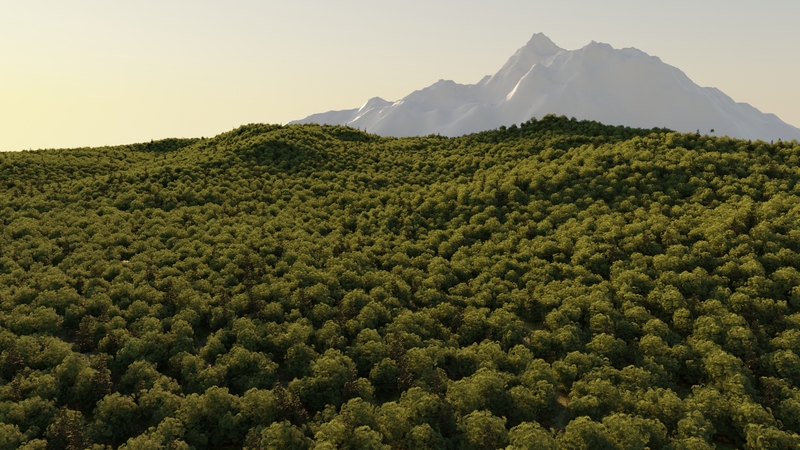 While the density may seem slightly low at first glance, this would look pretty realistic if you put a good ground texture under the trees, because normal forests have some clearings and/or meadows. If you want a higher-density example, I can take out the Density maps for the different tree types, though it’ll have a bit more homogeneous distribution of species as a side effect. Much, much faster than complicated geo duplicated. Agreed, but this is more of a stress test than an actual production scene, something that would rarely be useful beyond a few very specific edge cases (ex: a forest fly-through where the camera gets pretty close to a large number of trees), and even then you could use much lower-poly models for trees that the camera never gets close to. That’s awesome! Is this compatible with 2.8 or is it 2.7x only (for now)? This kind of scene rensembles what I tried to do. I already am above 11G memory with one single Base Tree and millions of instances. Rendering large scene took 2 to 3 minutes on my machine. Pre-baked impostor trees could be interesting to play with. It is a different topic. For me, it is too early to follow this path, I like to get a more in-depth knowledge on instancing/duplication based forest. Awesome! Gotta love future-proof plugins! That’s not true, it’s available for 2.7x as well. My methodology was a bit of a hybrid approach. The primary two tree types (deciduous) were implemented with hair, a large child particle count, and no density texture (because density textures don’t play nice with hair children for some reason). I used 300-400 base particles and 40 child hairs with interpolated distribution. To avoid visual repetition due to rotation clustering, I pulled a little trick. The hair particles were vertical (global z velocity instead of normal), and I used Velocity/Hair rotation for Collection instancing. To add variation in the child rotation, all I did was add a bit of noise to the child particles. The collection rotation appears to follow the ‘elbow’ direction for hairs with 2 segments. For the evergreen trees, I used a normal particle system, since individual hairs take more memory than standard particles. The main reason for this was that is the pine trees don’t look good without the density texture.